Honing in on diversity can increase the cash flow into your yoga biz! Happy October everyone! Hope you all had a wonderful summer. As the lazy summer days fade away, it is time to refocus and get back on track on with our businesses. As you refocus on your yoga business, I want you to think about your target audience. What does this audience look like? When you market your business do you have the Western ideal yogi in mind? You know, the gorgeous front cover model type that is young, thin, and disgustingly flexible? Or is your target audience more encompassing and realistic? I know you may be scratching your head at this point. 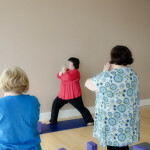 You are most likely wondering what your personal views of what the ideal yogi looks like has to do with your business. It may seem that The Business Side of the Mat has wandered off the business path, but not so. Just stay with me because your view on who practices yoga can have a large impact on your business – both positively and negatively. It is important to be aware of the paradox that exist in the Western world when it comes to yoga. On one hand, we are constantly hearing that yoga is for everyone. Anyone can do it. We are bombarded constantly the idea that yoga offers health benefits for almost every ache and ailment. However, while that message “yoga is for everyone” is being pushed out into the public, yoga magazines and ads are saying otherwise. The countless images of yoga in the media reflect a narrow standard of beauty. As a woman of color, I am very much aware of the media’s unspoken message that yoga is pretty, blond, white, supermodel thin, and bendy. Basically, the opposite of what I am. Everywhere I turn this message is reiterated over and over again. Whether it is in yoga or fashion magazines, advertisements, studio ads, etc. It is a rarity to see someone that looks like me representing yoga. So who is practicing yoga in the West? In the West, yoga continues to grow at an explosive rate. Recent surveys suggest that there are over 20 million yoga practitioners in the United States alone. Yoga Australia reported in 2013 that approximately 300,000 Australians practiced yoga and there were over 8,000 yoga instructors. Similar numbers were reported by the Sports and Recreation New Zealand organization in a 2007/2008 survey for yoga practitioners in New Zealand. The common denominator of the surveys conducted in these three countries? The practice of yoga was dominated by wealthy, highly educated white women. Take a look around your studio or the studios you frequent. Do the students and teachers accurately reflect the diversity in your community? And when I speak of diversity, I am not necessarily speaking of race, which is definitely a factor in many areas. I am also referring to age, gender, and shape. I find it ironic that the West depicts yoga as young, white females with “perfect” bodies being manipulated into these impossible postures. Yoga originally was physical, mental, and spiritual practices which originated from ancient India. Even further, since its inception thousands of years ago in India, yoga has been mainly taught and studied by brown skinned men. That’s a far cry from the look of yoga in the West. Clearly, something got lost in translation from the East to the West. So why is the diversity of yoga, or should I say lack of diversity, relevant to your business’s success? How can paying attention to who you are marketing your yoga business to impact your business’s bottom line? Here are three business reasons to diversify your target audience. #1 Broaden Your Fan Base, Increase Your Income. If you realize that you have been marketing to just one group of people, then broaden your marketing. The more people you market to allows you to increase your fan base and get more people in the door. Getting more people through the door helps to increase income. For example, if you only run ads that are geared towards wealthy white women that live in a certain part of town, consider running similar ads in an area that may have a slightly lesser wealth, but may be more diverse. Diversifying your marketing efforts can help your business grow organically. Another opportunity to broaden your fan base is paying close attention to the marketing materials you use. If you use pictures of people practicing yoga in your marketing materials, try to steer clear of stock photos that subscribe to the stereotypical Western view of a yogi. When selecting stock photos, look for photos with a diverse group of models. Better yet, if your students represent diverse backgrounds, shapes and sizes, then maybe use actual photos of your students in your marketing materials. These photos will accurately reflect your yoga business and will help attract your ideal tribe. Catering to your tribe is always good for business. #2 Avoiding the “Members Only” Image, Helps with Student Retention. Take a look around your studio. Does everyone look the same? Would someone who is of another race feel comfortable walking into the studio? How about a heavier, more curvaceous woman? Are you man friendly? Be aware of the unintentional image your studio may be giving off to the public. I have heard so many people say that they walked into a studio and instantly felt they did not belong and never went back. So many times I have found myself the only person of color in a yoga class. While this does not bother me because I grew up in a predominantly white neighborhood, it does bother other people of color. It is one of the biggest factors that keep many people of color from exploring yoga. They just don’t feel welcomed by many studios. If you determined your studio is homogeneous, then consider your marketing efforts and who you are directing your efforts towards. Are you singling out a section of the population with your marketing? If so, see #1. Granted, you will not be able to please everyone that walks through your door. However, make sure you are not unintentionally making some people feel unwelcome. Such an oversight could be costing you potential income. If new students feel their business is welcomed and fail to come back, then you are losing revenue stream. You don’t definitely don’t want that. #3 Find a Niche in Diversity. Taking the time to recognize the importance of diversity, or the significance of the lack thereof, in your area may help you to develop an income generating niche. Think of Anna Guest-Jelley, the the founder of Curvy Yoga. Anna has built a successful yoga business around targeting curvier women with a message that yoga is for all shapes and sizes. If you Google “yoga for African Americans”, you will get a list of articles discussing the lack of African Americans in the yoga classes and the uncomfortablility of that fact felt on both sides of the mat. 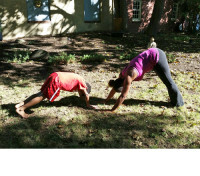 You will also find websites offering lists of black own yoga studios and teachers. Diversity includes those with physical disabilities as well. Throughout the United States, there are a growing number of studios offering classes specifically for those with physical disabilities as well as particular ailments, such as Parkinson’s Disease. Then there is one particular client of mine who has developed a successful business providing yoga therapy for senior citizens who suffer from chronic pain. Talk about a niche! Stepping away from the traditional perspective on yoga had allowed her to build a very lucrative yoga business. Take a closer look at your local community and see if you can determine an under-served yoga niche and then start marketing directly to that group. Or even better, go and talk to people from that niche first, find out what they want, create what they want and then offer it to the niche. Yoga truly is for everybody. All colors, shapes and sizes should be embraced by the yoga community. Tapping into diversity can allow you to open the doors of your business to a new target audience, which in turn can reward you with increased revenue. Being encompassing and accepting of all is not only good karma, but it makes for good business sense as well. Anna Guest-Jelley of Curvy Yoga tells us why curvy yogis are under-represented in yoga classes and yoga media, and what she's doing about it.